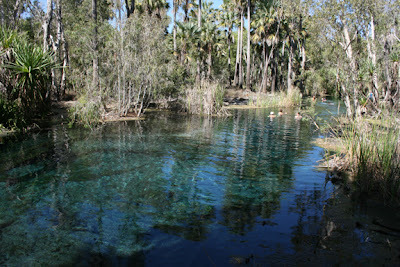 Well its been a few days without electricity/Internet and then a few more days indulging in the Mataranka Hot Springs. So I have a few things to update you on. Tuesday we left Kakadu after having a very educational and relaxing week. For the next week or so we will actually be backtracking over roads we travelled on our way up to Darwin. No way around it as it's the only way to get to the west. 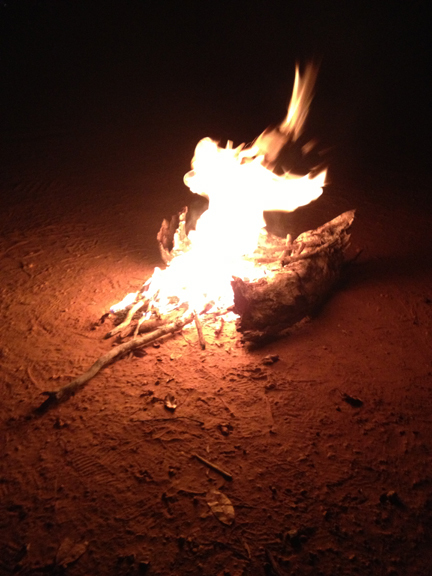 We spent Tuesday and Wednesday nights in Nitmiluk National Park at Leliyn (Edith Falls). Once again we were surrounded by beautiful scenery but I was unsure how much swimming was going to get done here as the signs did say that there were Freshwater Crocodiles in the water. But I thought maybe I'll give it a go, but then I stood in the water and it was absolutely freezing. Now I like swimming but freezing water and crocs both go against my grain! But we still had a nice relaxing two nights there. On the second night as I lay in bed and listened to a pack of dingoes howling to each other in the distance I knew "Life is Good". 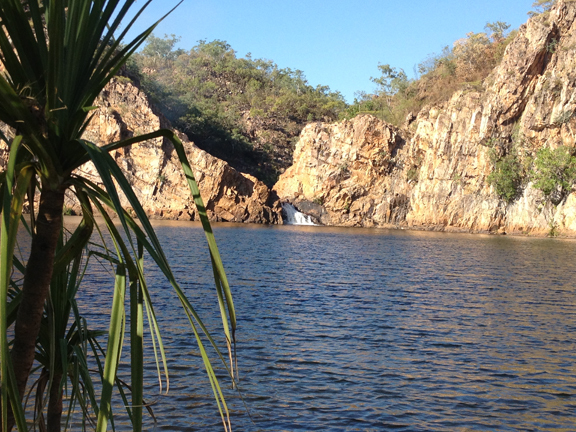 Then it was off to Mataranka for a few days of indulgence in the hot thermal springs. We did have two nights here on our way up to Darwin, but knew we would be coming back and am I glad we did. There are two thermal springs, both located in the Elsey National Park. Bitter Springs is Matarankas newest spring and has been maintained in a fairly natural setting. 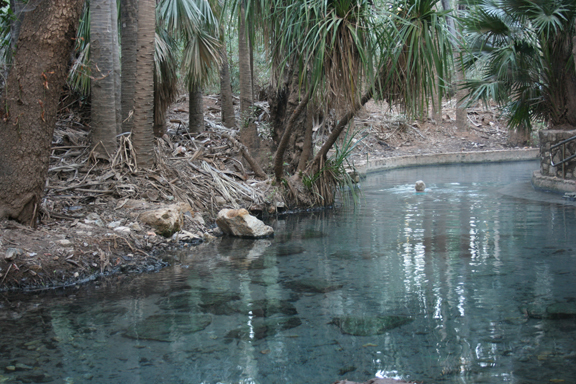 The main Mataranka Thermal Spring is closest to our camp , which is an easy 2 minute walk. The water is unbelievable clear and is a consistent 32c and very very relaxing. 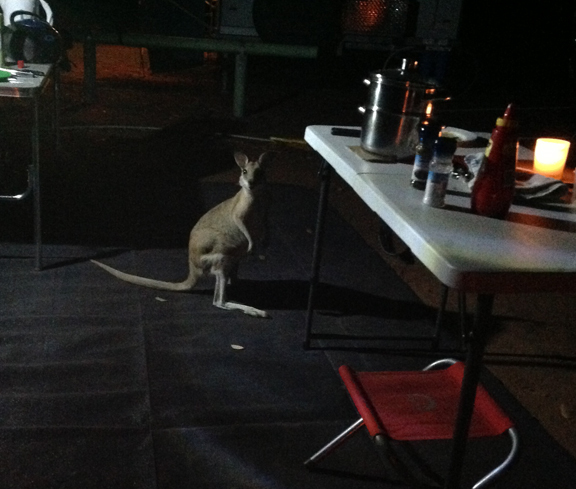 Last night we decided to light a fire and sit by while star gazing and along came a guest for dinner. Our little dinner visitor - no I didn't feed him or eat him! This morning I wandered down to Stevie's Hole which is where the small springs flow out into the Waterhouse River. 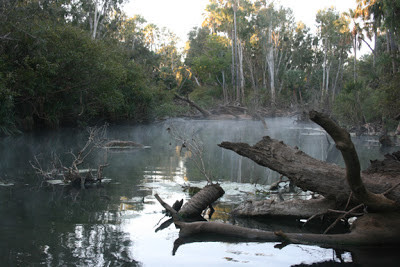 It was such a peaceful sight with the steam rising from the warm water and on the side of the river a metre long freshwater crocodile slept in. We are heading north to Katherine tomorrow morning - and not a moment to soon! Two bus loads of kids just arrived - I've have my kid days, I'm outta here!! Yup two things I like to avoid as well when going out to swim, crocs and freezing cold water! The fire looks so relaxing, cute guest which stopped by for a visit! 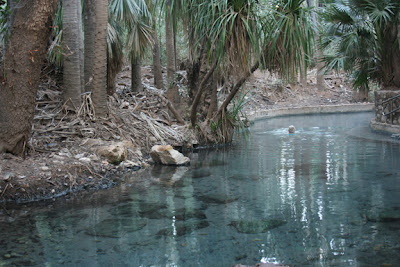 The hot springs, now that sounded good, well until you mentioned crocs again! That pool looks so inviting and tranquil! Davine, you will have to stop posting such photos!!! lol We northerners get all crazy when we see things like this! !